On Sale. 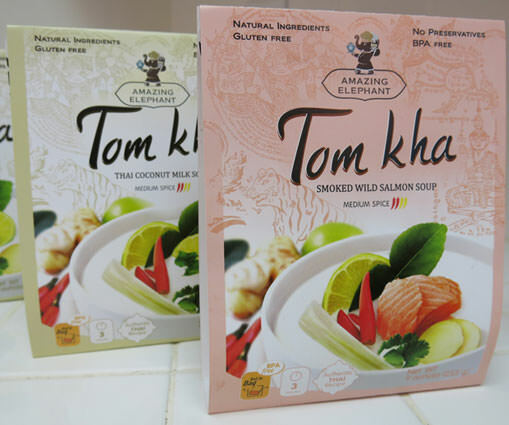 Real Authentic Tom Kha Soup with Wild Caught Smoked Salmon Sealed in a Pouch Is Delicious. It's All In The Pouch. After years of development, we are happy to introduce this. Ready-to-eat, premium quality, authentic and delicious Tom Kha soup made in small batches using the highest quality ingredients. Amazing Elephant brand puts everything in the pouch and cooks it to perfection. This all-natural, gluten-free, preservative-free soup is precooked in a modern BPA-free pouch that's shelf stable for two years but tastes like it was just made fresh. Premium ingredients and sophisticated preparation ensure that this rivals anything a Thai restaurant serves. More about Amazing Elephant Tom Kha.